Though spontaneous fire seems like it would be a rare natural phenomenon, they are actually quite common both above and below the ground. Usually fueled by underground coal, gas, or oil seeping to the surface, some of these “eternal flames” have been burning continuously for centuries—and yet remain oddly obscure. Located behind a waterfall in Shale Creek Preserve south of Chestnut Ridge Park in Northwestern Pennsylvania lies a strange natural flame that is made even more beautiful and odd because you can see it through the falling water of the waterfall. Legend has it the flame was first lit by Native Americans thousands of years ago. Though we know the Chestnut Rige Park’s fuel source (ethane and propane),scientists do not know where it is coming from or how it gets to the rocky enclosure. A recent study has determined the ground is not hot enough to ignite the gas and keep the fire burning, nor is the underground shale deposit at a depth where it should be able to fuel the fire. So how does the Chestnut Ridge Park natural flame work? More research is needed, but for now it remains a beautiful and mysterious phenomenon. These fires have been burning for at least 2,000 years, and their light once helped ancient mariners avoid rocky shores. The source of the fuel for the eternal flame is thought to be methane gas seeping up through the ophiolite—seabed rock that has been lifted up and pushed onto the land. Jharia, India is home to one of the largest coal mine fires in the world. At least 70 different coal mine fires now burn as one, dumping thousands of tons of carbon dioxide into the atmosphere each year. India is the fourth leading generator of greenhouse gas emissions in the world, and the burning coal mines are a major source of this pollution. Coal mining in Jharia has been going on since the late 1800s, and the first reported fire goes back to the 1920s. However, the problem really began in the 1970s when the coal mining companies switched from below-ground to above-ground practices, which leaves the coal exposed to oxygen when not properly closed—meaning it can easily be ignited. Soft coal can even spontaneously combust at temperatures as low as 40 Celsius (104 F). Once started, the coal fires are almost impossible to put out (and since there is no economic incentive for the mining companies to bother, little effort is made). As they advance, the fires erode the ground, which has led to entire houses and even railroads being swallowed: In 1995, a riverbank was compromised by an underground fire that caused the wall to collapse, flooded the mine, and killed 78 workers. 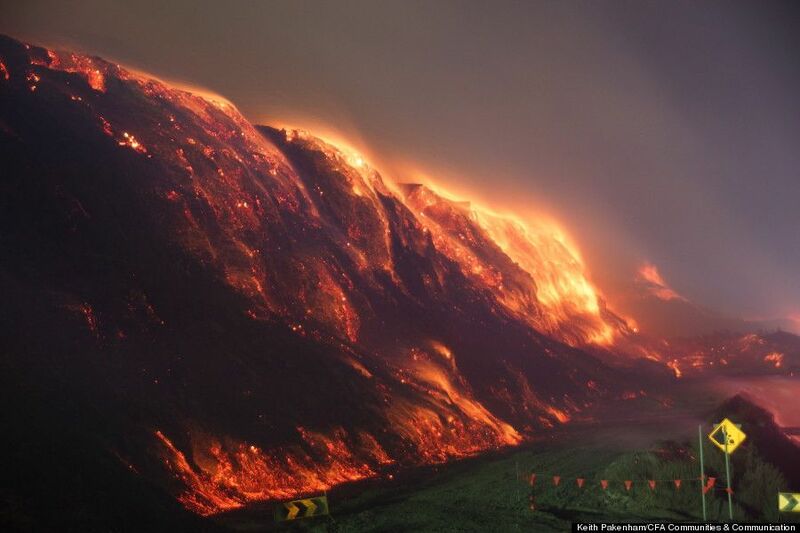 The underground coal fire that creates what is called “Burning Mountain” (Mount Wingen) near Wingen, New South Wales, Australia was probably started by lightning or spontaneous combustion. At least, that’s the assumption—no one knows for sure because it has been going strong for at least 6,000 years. Acientist’s believe it may be the oldest known continuously burning coal fire. The blaze moves at a rate of about 1 meter (3.3 ft) each year due south. That may not sound like much, but given its age, simple math tells us that the coal fire has moved at least 6 kilometers (3.7 mi) since it started. At this rate, the fire should reach the outskirts of Sydney Australia, a distance of about 280 kilometers (173 mi), in another 255,000 years or so. In 1850, Captain Robert McClure was sailing his ship Investigator in the Arctic in search of the Franklin Expedition, which disappeared trying to find the Northwest Passage. He never found Franklin’s crew (and no one else ever did either), but he did rediscover something else: massive fires on the rocky shores and peaks of Cape Bathurst. McClure assumed the fires were set by the local Inuit people to get their attention, so he sent a landing party to see what was going on and look for information about the fate of the Franklin crew. The shore party returned to the ship with no such information, but they did bring along a curious piece of rock. When they set the rock on the Captain’s mahogany desk, it burned a hole right through the wood. They had rediscovered the Smoking Hills. Franklin himself had discovered and named the Smoking Hills on his 1826 journey to try to find the Northwest Passage. He recorded the presence of weird smoke coming from fires in the hills, smoke that was visible from the sea, and fires that burned where there was little to no vegetation. The Inuit had called it the “land of sour water” because the burning underground oil shale left behind water that was highly acidic and poisoned with heavy metals. Taiwan has some of the most fantastic mud volcanoes and natural springs in the world. Because of the local geology, these mud volcanoes produce methane gas. Near the Biyun Temple there is a place where the burning gas has been named “Water and Fire Cave.” Yet it is not a cave at all, but a rock face with a spring and a small pool of water, with methane gas bubbling up to the surface. The methane gas bubbles fuel the continuous fire, which gives the appearance of fire burning on rock and from the water. Though the flames have decreased from their once-prominent three-meter (10 ft) height, they are still impressive. Local history claims the site was discovered by a monk in 1701, meaning this flame has been burning continuously for over 300 years. In Indonesian tradition, there is a legend that begins with Sunan Kalijaga (one of the “Nine Saints of Islam”) and his followers tired at the end of a long journey. They stopped to rest for the night at the village of Mrapen, but they were cold. Kalijaga stuck his stick into the ground, pulled it out, and brought forth flame to warm them. The flame is considered to be sacred in Javanese culture and has been used to light “eternal flame torches” for Indonesian sports tournaments. First recorded in the 15th century as a “flame (that) never extinguishes, not even in the middle of rain or winds,” it still burns to this day, fueled by natural gas leaking from deep underground. The burning coal seam at Brennender Berg in Saarland, Germany ignited in 1688 and has been burning ever since. No one is sure how the fire started (probably spontaneous combustion), but legend has it a shepherd lit a fire near a tree stump, which went through the roots and into the coal seam. What is known for sure is that the famous poet Johann Wolfgang von Goethe visited Brennender Berg in 1770 and wrote about his travels and encounter with the burning mountain: “Dense steam arose from the crevices and we could feel the hot ground even through the thick soles of our shoes.” There is even a plaque memorializing his visit at the site. Though the intensity of the coal fire has lessened since the 1800s, visitors can still see smoke rising from the rocks and even feel hot steam coming from cracks and openings. It is said that before the fire intensity lessened, schoolchildren were taken on field trips to see the burning mountain and would steam eggs at these openings. Located at the center of an enormous oil field in Iraq is the eternal fire of Baba Gurgur. It is created by natural gas which percolates up through the rocks. Local legend claims that the fires were used by shepherds to warm their sheep in the cold months of the year. Legend also has it that pregnant women would visit the flames if they were hoping for a boy. This natural fire formation may be the source of the Biblical story of the “fiery furnace” into which King Nebuchadnezzar threw three Jews for refusing to worship a golden idol. For thousands of years, native people have used the natural asphalt at Baba Gurgur for their homes, their roads, and other things. The flames are visible for miles, and visitors to Kirkuk, Iraq can see them from the city. The flames also emit deadly hydrogen sulfide gas, so visitors are told by warning signs to stay upwind of the smoke. There are many legends of how natural flames came into being, but none is quite so brutal as the Hindu legend of the eternal flame at Jwalamukhi Temple. It says that Prajapati Daksha humiliated his daughter Sati at a party, making the princess so upset that she set herself on fire to escape the shame. In retaliation, her lover—Lord Shiva, the God of Death—cut off Daksha’s head and wandered the universe carrying the burnt body of his deceased love. Eventually, Lord Vishnu cut apart Sati’s body and cast the pieces to Earth. Her tongue landed in the Jwalamukhi temple and instantly brought forth her power center—which manifested as a flame. Therefore, the Temple of Jwalamukhi is dedicated to the Goddess of Light. At the temple, located about 50 kilometers (31 mi) from Dharamshala, one can see eternal blue flames of burning natural gas coming from the rock sanctum of the temple. There is no idol in the temple—what is worshiped as a deity is the flame itself. Thousands make pilgrimage to the temple each year, bringing gifts of candy, fruit, and milk. The Billion-Year Technology Gap: Could One Exist?